Anthony Gonsalves, a pioneer who orchestrated music of Hindi films as a stepping stone for the whole film industry of India, died at 85. He was admitted to GMC hospital due to illness. 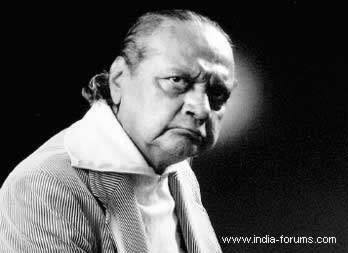 Gonsalves, a legend of film music, would be buried probably by Sunday, after his son arrives from US. He was living at his ancestral house at Majorda with his daughter Laxmi for several years. However, his presence was taken note of in the last two years, by felicitating him during IFFI last year and releasing a documentary “Anthony Gonsalves – the Music Legend”, produced by Shrikant Joshi and his wife Mrinalini. Known to be a master music arranger, Gonsalves has arranged, composed and conducted masterpieces in over 250 films. He has not less than 1000 songs to his credit. Just not melodious songs but a song like ‘Jyoti Kalash Chalake’, sung by Lata Mangeshkar to the tune of Raag Bhupali in the film ‘Bhabhi ki Chudiyan’ was decorated with musical arrangement of classical touch by Gonsalves. “I learnt Indian music from Pt Ravi Shankar and Pt Ram Narayan; not from music directors in the film industry,” he has said in the documentary. He preferred Indian music for orchestration though the roots of his musical knowledge lie in the Western music. That is the reason Gonsalves could give masterpieces like ‘O Sajana, Barakha Bahar Aayi’ of Parakh, taking music director Salil Chowdhary to a memorable height. He began his career in 1943 with Bombay Talkies, with great musicians like Anil Bishwas, Gulam Haidar, Shyam Sundar, Naushad, Sachin Dev Burman, Ghulam Mohammed, Salil Chowdhary and Madan Mohan among others. The glimpses of his music arrangement still beat our heart if we listen to songs like ‘Aayega Aanewala’ (Mahal), ‘Thandi Hawayein’ (Naujawan), ‘Yeh Raat, Yeh Chandani Phir Kahan’ (Jaal) to ‘Suhana Safar’ (Madhumati), ‘Bachapan ki Mohabbat ko’ (Baiju Bawara) to ‘Nain so Nain Naahi Milaao (Jhanak Jhanak Payal Baaje)’, and ‘Hum Pyar Mein Jalnewaalon ko’ (Jailer) to ‘Chalo Dildar Chalo’ as well as ‘Mausam hai Aashiquana’ (Pakeezah). v sorry to hear about Shri Anthony bab...a musician par excellence ! great loss to the music fraternity,bollywood and general music lovers like us . May God rest his soul in peace ! What is understated is Anthony Gonsalves is the one who created notation for classical indian music thereby making it possible to write ragas and not merely sing. This single act of his has made him immortal in Indian Music besides the song "My name is......". state of Goa and Govt. of India should pay an appropriate tribute to him by atleast a Padma Award, for which as per my information his name was already suggested to the committee .